With the World Cup fast approaching (only three short days away! ), Brazil is increasingly being pushed onto the global stage, and the country is scrambling to prepare for its biggest global show yet. (In)famously known as the eternally emerging market, Brazil is a country of vast dichotomies — a country that is as full of life and resources as it is stricken with poverty, a country as diverse as it is segregated, and as forward-looking as it is rooted in its traditions. And (un)surprisingly, it would be once upon a Southern summer day in Rio that I would find the spirit of Mumbai, India. Over New Year’s, I decided to trade the white sand beaches of Ipanema for the more humble walls of Complexo de Alemao, one of the most (in)famous favelas — or shantytowns — in Rio, the ‘City of God. Situated in the heart of Rio, some 30 km away from Copacabana in the neighborhood of Nova Brasilia, Complexo de Alemao is a sprawling complex of 18,000+ homes connected by a network of 152 gondolas, affectionately known by locals as “Bondinho do Alemão” (the same name given to the tramways at Sugarloaf Mountain and Santa Teresa). As I spent a good part of a week within the walls of the complexo with the ever-good natured and warmhearted Dona Rita, I spent a good many of those hours reading Shantaram, Gregory Roberts’ novel about an escaped Australian convict who finds his way to Mumbai and the web of slums and gangs that are at the core of the city. In many ways, the favelas of Rio weren’t all that different from the shantytowns / slums of Mumbai that Roberts painted in his book, and I found myself transported to India on more than one occasion, where the relationships being described in Shantaram about Mumbai’s slums could just as easily have been describing the favelas of Complexo de Alemao — a society with community and family at its core, a fragile trust between authority and residents that stood to shatter at any given moment, and a system that operated more in grey than anything else. Even though Complexo de Alemao – like several of Rio’s other major favelas like Rocihna and Vidigal – are considered ‘pacified’, the definition of what that actually means can vary. For the Complexo, pacification went only bullet-deep, meaning that the traded gunshots in the night that had once been so commonplace now happened only once a blue moon. 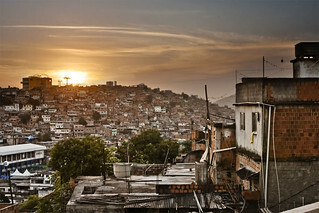 It still means that the favelas continue to be a steady destination and origin for the flow of drugs throughout Brazil and Latin America (Brazil is one of the largest consumers of cocaine, attributed in part to its growing prosperity and its proximity with some of the largest cocaine producers in the world in its neighboring states. A good chunk of Brazil’s military efforts in the Amazons continue to focus on reducing drug import from neighboring Colombia). It means that anyone who actually speaks with the ‘BOPE’ (a special unit of the Brazilian armed forces dedicated to maintaining peace within favelas) are at risk of raising the ire of the favela’s drug lords who still hold a tight rein on the comings and goings of day to day life. And like India’s urban slums, Brazil’s favelas have left the government at a loss of what to do to actually make deep, systemic change. On one hand, there’s changes in basic infrastructure and improving basic living conditions such as health and sanitation (the place I stayed at with Dona Rita was actually very well equipped with running water, a water heater, and even an AC to battle the 100-degree F Rio sun). On the other hand, and arguably much more arduous and prolonged a path, is the one of building trust and community between those within and outside of the favela’s walls. In Vidigal, one of the most prominent favelas in Rio tucked between Leblon and Ipanema (two of the most desirable and most visited beaches in all of South America), hotels like the Grand Shertaon, which sits right at the foot of the favela, pays annual dues to the druglords of Vidigal to guarantee that no harm shall befall any of their guests (any resident who dares to break this trust will soon enough find themselves looking down the gun barrel of a druglord’s pistol) — not unlike the arrangements that are made in faraway Mumbai that Roberts describes as part of his experience. In truth, the lives of Mumbai’s slums and Rio’s favelas aren’t that far apart, and stepping inside, even for a week, reveals a world that turns up so many more shades of grey than the black and white we normally read and see. And for Brazil, as the opening games kick off in Sao Paulo this Thursday, the World Cup will be a rare opportunity to show how communities in transition can be bridged, both within and outside its borders.